Ray Carroll (@raycarroll55), VP Sales at Engagio, launched his career hustling for an event management company. Now, he’s celebrating his seventh year in Silicon Valley advocating for the next big SaaS platform for marketing and sales. Ray forces himself to raise the bar in everything he does by doing what he calls, “burning the ships behind him.” Simply put, this means he sets himself up for no other option other than to win. After each step in his career, he looks for the next realistic step. Ray says to think of these steps in succession starting from a hill to a mountain then the moon and finally the stars. You can apply this thinking to your career, your company, and your personal life. He knows a great leader must evolve with the times. Today’s salesperson has to leverage social, phone, and email at the same time. Ray believes it’s imperative to be active online while, at the same time, understanding no one wants to be sold. You genuinely have to get to know people and he believes this relationship begins with social. 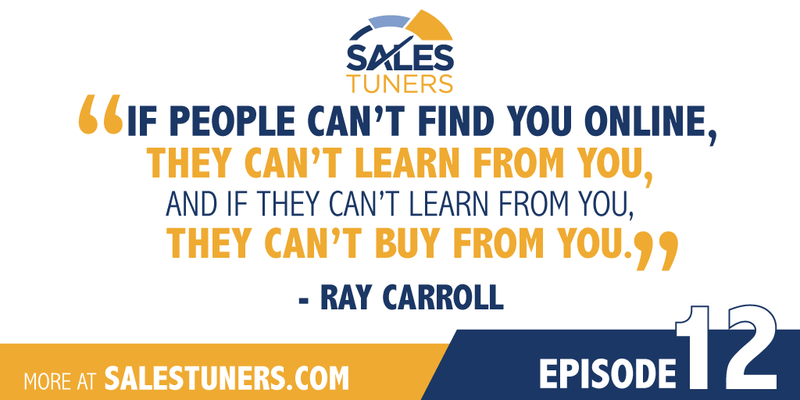 Ray talks about modern selling regarding the “flow of three,” saying you open doors using social to flow seamlessly from email and then to phone, with the goal always driving to a phone call. Social and email just maximize the phone time. No matter where your career goes, you have to decide to win. If your first instinct is to look for excuses, well, then you’ve already lost. Know the Vice: In today’s world where people may have 10-15 different inboxes, figure out the best way to communicate with prospects individually. Whether its email, Snapchat, Twitter, LinkedIn, or phone etc. don’t rely on just one channel. Be Found: If people can’t find you online, they can’t learn from you, and if they can’t learn from you, they can’t decide to buy from you. Invest time in building your social presence to grow your visibility and perceived thought leadership.